Another Herald Digipoll is out today, with a sample taken both before and directly after the Budget. 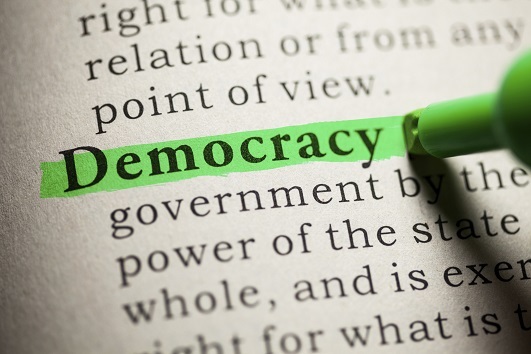 The poll pretty much confirms what Roy Morgan showed us last week – the gap between the two main parties remains about fifteen percent and the controversial and highly publicised Fairfax poll was probably a rogue. Of course, the Herald’s primary purpose is to sell newspapers, not provide you with a considered analysis, so they have to make this poll sound interesting. The angle this time is that there’s been no bounce for Labour from the Budget. That’s to be expected – this far out from an election changes in party support tend to build up over time, not as a result of one single event. The key here is to look at the trend in multiple polls over time. Trying to read too much into any single poll makes sense for the people who commission them, but for the rest of us it’s pointless. I dont see the greens getting eight seats in the upcoming election. I wouldn’t expect a bounce from the budget. The majority of people I talk to, most of whom are essentially apolitical, just want a tax cut. Until they have a point of comparison, Labours offer is basically meaningless. I think if there’s a bounce, it’ll come from the medias swing against National for being a bunch of cagey, noncommital, deliberately deceptive no hopers. That’s what I like about you Brett – you don’t let the facts get in the way of your moronic bias. There’s a cartoon in that. I wonder if Tom Scott reads The Standard? Tom Scotts effort today made me smile. I like the way he draws Key. Tane: so can I assume you won’t be arguing that Nationals slight dip in the polls is down to their strategically delayed policy announcements ? Bryan, as I’ve made clear in the past, slight dips don’t mean anything given the sample sizes and methodologies these polls rely on. All you can do is look at trends over time. 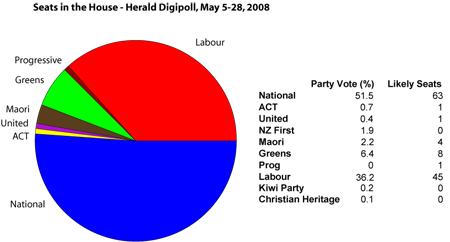 Tane: looking at the Party Vote chart on the NZ Herald site the trend does seem to indicate a consistent widening of the gap. I agree with T-rex in not expecting to see a bounce from the budget. Those who follow the political world might have paid close attention, but many of my friends are only aware that it occured at all (and even then, the idea that parts of it are relevant to them won’t kick in until they encounter it in real life). Media however, see polls as a logical follow up story. But I think the NZ Herald might be pushing it a little to describe their poll as catching a post budget mood, given the polling period was May 5 to 28, and the budget was delivered the afternoon of May 22. And with only 400 in the post-budget sample the margin of error (4.6%)is the 4th largest party vote after national, labour and the greens. Why no undecideds? It distorts the result. Is the print version of the poll the same as the online version? In the online version I see, the Green level of support isn’t mentioned at all explicitly despite being the 3rd-highest polling party from the sole sentence about them saying they would get in and have two more MPs. Where did you get the full set of numbers for your post? I can’t find them online. Not the full result by any stretch, with the Green number missing in action. Also, Greens trend to poll well until Peter Dunne starts talking about marijuana. They’ve had up to 15% in the past at this stage of the election cycle. Climate change and peak oil are big issues for enough voters that the Greens have scope for making ground this time around. Brett Dale. You’re hardly an authority though, are you? SW: Click on the ‘view photos’ link on the Herald article – it’ll bring up a couple of charts with the relevant figures. Regarding the captcha, just click the refresh button and it’ll give you a new challenge. I’m sure Labour expected to a bit of a bounce from Cullens big spend up. As many commentators are saying the phone looks to be off the hook. It is not going to get much better for Labour with Anderton shafting part of the fishing industry. I would have thought the people losing their jobs are (were) labour voters? The Dolpin lovers were always going to vote green anyway. I wonder if it occurred to you mike that a decision to stop a species from going extinct might have been made for reasons other than vote-winning. Like maybe stopping a species from going extinct? Bryan, the kind of trend I’m talking about is over a decent period of time across a range of polls. A couple of Herald polls showing a few percent here and there doesn’t tell you anything. Go have a look at the graph over here. Asked to name their most important election issues, 1% mentioned the Electoral Finance Act (AKA “fascism”, according to John Boscawen & co). Less than 1% support ACT. And they are all men. Yes, that’s right – after making 1279 phone calls they could not find even one woman in New Zealand who wants to vote for Rogernomics. Not one. Well it looks like on that poll they couldnt find one person who wanted to vote for the Progressives!!! Yeah, the Jim Anderton Fan Club just dominates the blogs. What a stupid comparison. RS – Its election year. Every policy will be seen as a winner or loser of votes. Good on them for doing this if its what they believe in but the cynical part of me thinks its a sop to the Greens in return for ETS support. gobsmacked: ACT’s reported supporters in this poll might very well all be men – but given the sample size (what, ten people?) you can’t possibly draw any statistically valid conclusions from that. People in the big cities who have never laid eyes on a dolphin will think the announcement is wonderful (which it is) so they’ll probably win more votes than they’ll lose. No government wants to have a charismatic species go extinct on their watch and the country doesn’t need to lose its clean green image in key markets by having that happen…and quite aside from all of the cynical reasons I just mentioned, it is absolutely the right thing to do.